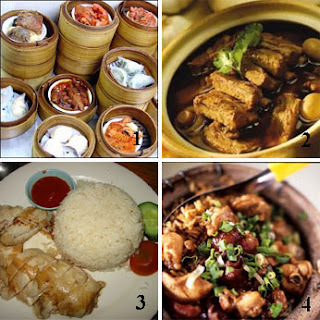 Chinese food in Malaysia is mainly Cantonese, Hokkien, Hainanese, Teochew and Hakka styles of cooking. Chinese food is generally milder compared to Malay or Indian fare. But thanks to the influence from this multiethnic country, Chinese cuisine in Malaysia, has taken on a spicier touch, often reinventing classic Chinese dishes. Many Chinese dishes are unique in Malaysia and not found in China. Dim Sum is a Cantonese specialty, and is usually consumed during lunch or as a brunch (breakfast & lunch). Traditional dim sum includes various types of steamed buns such as cha siu baau, dumplings and rice rolls (cheong fun), which contain a range of ingredients, including beef, chicken, pork, prawns and vegetarian options. Dim sum restaurants are usually large, noisy affairs – the dim sum served in little baskets or bowls and are whisked around the tables on individual trolleys or carts. As they come by , you simply ask for a plate of this or a bowl of that. At the end the meal you are billed according to the empty containers on your table. My favourite Chinese food – A very popular Hokkien herbal soup – pork ribs are long simmered in a ‘tea’ of Chinese medicinal herbs and whole bulbs of garlic, often with dried shitake mushrooms added for earthiness. Ready-made Bak Kut Teh, containing all the essential herbal ingredients usually available in Chinese medicinal shops and supermarkets (Giant, Carrefour etc), are very convenient for ‘brewing’ an authentic-tasting, aromatic and nutritious Bak Kut Teh at home! This one-pot rice meal has a smoky exotic aroma cooked in claypots with a combination of thick soya sauce, roast pork, Chinese sausages and mushrooms.